August 9-December 21, 2002. 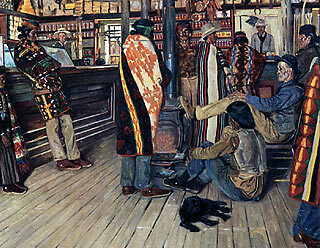 The artworks can be seen at Hubbell Trading Post National Historic Site. 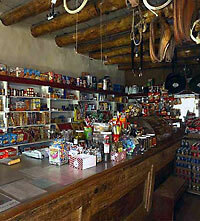 Visit Hubbell Trading Post, the oldest continuously operating trading post on the Navajo Indian Reservation. Hubbell family members operated this trading post until it was sold to the National Park Service in 1967. The Western National Parks Association, a non-profit organization in the Hubbell family trading tradition, operates the trading post. See paintings and drawings by E.A. Burbank who spent a lifetime painting the American Southwest, portraits of Navajos, and images of Navajo rugs. Park collections are rich in Navajo textiles, silverwork, oral histories, and artwork depicting the Navajo community and the Hubbell family. Elbridge Ayer Burbank works comprise almost one third of the Hubbell fine art collection. The oral history collection contains interviews with over 160 people conducted between 1960 and the present. It draws fascinating stories about Navajo or Diné life, the Ganado area, its people, and Navajo weaving.